Daniel had a really good day today. It began early with a dose of oxycodone to prepare for the removal of the epidural which has kept him pain free these last three days in bed. Getting the epidural out was not a big deal and he handled it well. Then at 8:30 he had his first physical therapy appointment which consisted of sitting him up and transferring him to his wheelchair, where he could stay for an hour. He was so pleased to be up and wanted to get moving. 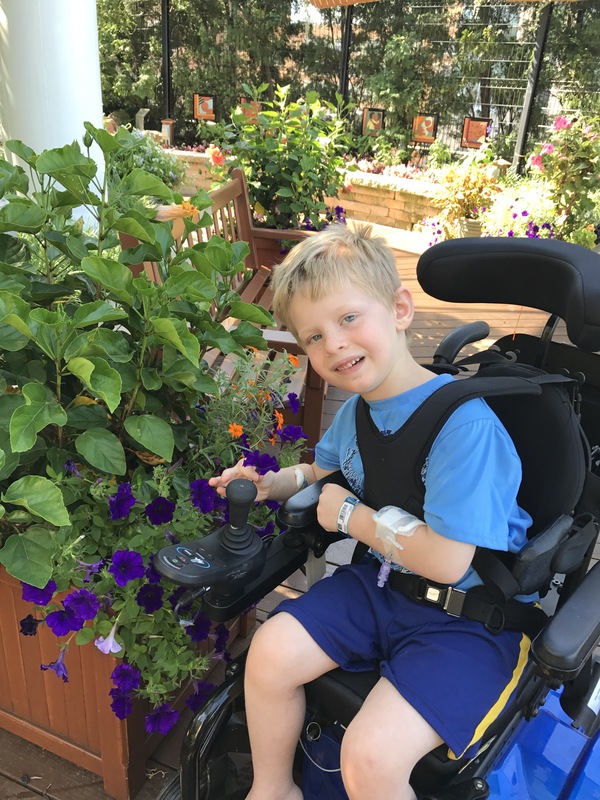 We visited a new friend, Noah, who had SDR the day after Daniel, and then headed out to explore and found the beautiful rooftop garden down on the 8th floor (we are on the 12th, four floors above the rooftop garden – figure that one out!) and we made a quick stop in the children’s playroom. Our hour was quickly up (and slightly extended), then it was back to bed until his 1:00 p.m. physical therapy appointment, where he went through the stretching regimen which we will need to implement at home. He was asking to walk, and does not yet seem to comprehend that, while walking independently is a goal, it will only come after months of hard work. After his afternoon PT appointment he stayed up for another hour or more until he finally began to complain of his back hurting, so he was carefully put back to bed for the remainder of the day. Last night was rough on Mom as the night nurse was frequently in the room and was not very quiet, so tonight Dad is staying at the hospital with Daniel and Mom gets a night of sleep at home. Sunday will bring two more therapy sessions and continued improvement. Our aim is a midday Monday departure for home.